Fairey Associates entered a Team into this years race, raising over £200 for Age UK Essex. 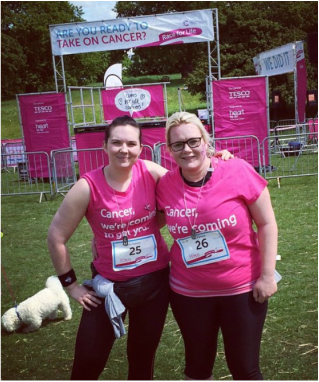 Determined to get in (even better) shape for the new year, Lauren and Jo teamed up to take on the challenge of the Brentwood 10K Race for Life on 30 May 2015. The girls would like to raise £300 for Cancer Research and would be grateful for any donations. Fairey Associates were proud sponsors of this year's Chelmsford Centre Supporting Voluntary Action Awards Ceremony. This local charity is an independent support and development organisation set up to champion, support and strengthen local charities and voluntary community groups. Well done to ﻿﻿﻿﻿Lauren who managed to finish the London South Tough Mudder course which was, as expected, 'tough and muddy'. Lauren told us "I was part of a fantastic team who worked our way around the 12 mile course. It got particularly tough at the 10 mile mark but we finished together as a team. Thank you to everyone who sponsored me". Lauren managed to raise over £200 for the Help for Heroes. It was agreed by all that as this event involved cakes, Fairey Associates should take part in this special Macmillan coffee morning. To add some excitement to the proceedings, a competition for home made cake was set. With some taking it more seriously than others, a large array of sweet culinary delights were brought into the office, including a chocolate and mint cupcakes, a carrot cake and chocolate brownies. An independent judge was required and so Lyndsay Pennick was brought back from Maternity Leave to taste and pick a winner. As well raising over £70 and increasing our daily calorie intake, Jo Rose was crowned Fairey Masterchef with her interpretation of the classic coffee and walnut cake. Jo entered and completed her first half Marathon raising £630 for Little Havens Hospice. Completing the race was quite an achievement seeing as Jo had not entered any kind of race previously. Jo thanked everyone who sponsored her saying "it was your help and support that helped me smash my target of £500. It wasn't easy, in fact it was a lot harder than I anticipated. It was very hot and VERY hilly, however I completed it and am very pleased with myself".